It’s great and I am not going to apologise for it. At the same time however, I appreciate a varied and balanced diet and I am well aware of the stark reality: there is no way the planet can sustain all of us eating like the average American or Brit. No matter how horrifically dystopian and efficient our ‘processing’ of animals from gamete to carcass to polythene wrapped product, no matter how technologically advanced, no matter how genetically modified, we would still need several planets to reach that endpoint. So you can see I am a little torn, people. I love meat and take the abundance of it for granted but at the same time have a good appreciation of the fact that the average supermarket product is quite the abomination. We should be buying less and it should be more expensive due to superior welfare and sustainable farming. I don’t have many answers: I can see where the world is moving and it doesn’t make sense. Perhaps the only way we can make a difference is to swim against the swell and currents of our consumerist world and hope that if enough of us do so it will become the accepted wisdom one day. On that note I provide you with a simple combination of ingredients and flavours. 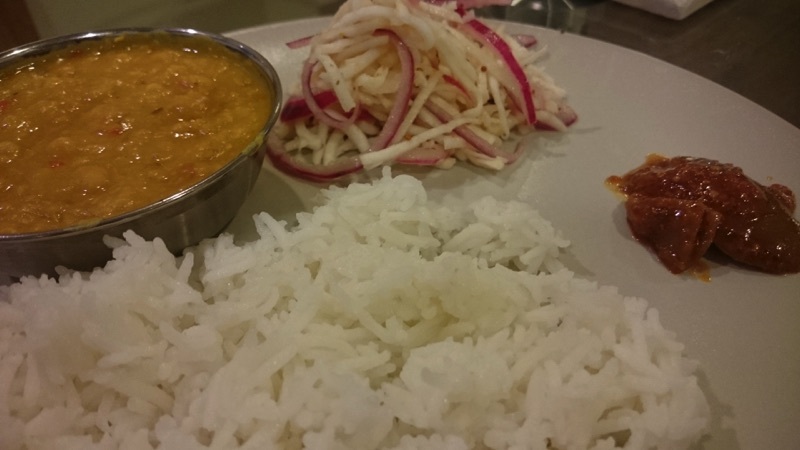 At the heart of this is a meal that sustains millions of Indians everyday: lentils and rice. This meal ticks a number of boxes: delicious and comforting, an excellent nutritional profile with lots of plant protein, sustaining and healthy, cheap and totally vegan. Lentils are still much maligned in Britain: their image may have improved a little from Neil’s favourite staple (the hippie in the Young Ones) but not hugely (unless your name is Neil and you are a hippie). Others have tried and here is my attempt: this is a very simple dish to cook and is totally delicious and very comforting: rich, creamy and fully flavoured. What’s there not to like? I include another salad, because I like to and this one came to me in a flash of inspiration: I’ve taken the classic concept of celeriac remoulade and moved it in another direction, adding a pungent mustardy dressing but foregoing the mayo, and then adding macerated red onions which I am a little obsessed about anyway. Marinating the onions in vinegar and salt turn them an electric pink and they taste amazing as the pungency abates, letting the acidic sweetness sing. Cut the onions into thin rings and halve. Add them to a bowl and add enough white wine vinegar to cover them and the salt: mix. Now leave to happily macerate for at least 30 mins, all the more for longer. Admire the shocking pink colour and devour (if not adding to the celariac salad!). Here is the celeriac when united with said onion-ness. Use a food processor to grate the celariac, or alternatively do so using a grater or a knife. Mix the rest of the ingredients and add to dress the salad and then mix in the onions. 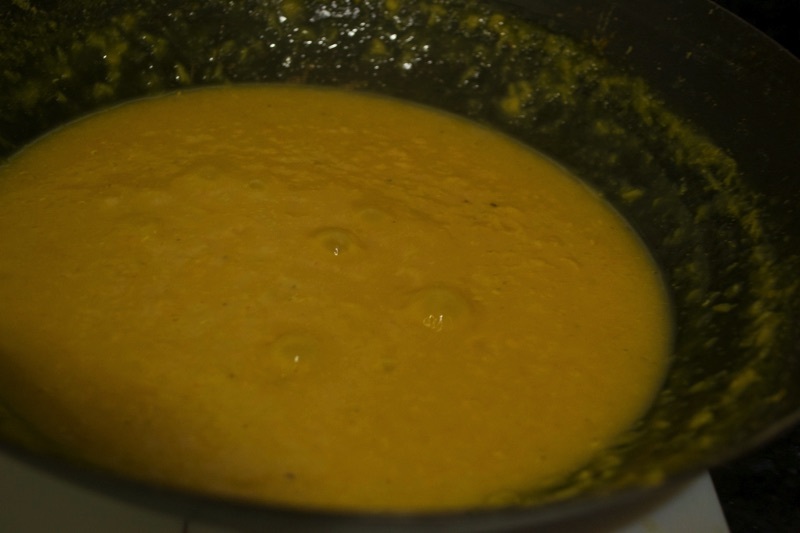 There are of course, googolplexes of dhal recipes online. Here is a very simple one which works very well. The red lentils breakdown to provide a creamy base, and the channa dal provides some texture. We spice simply: we want brightness and heat to counter the earthiness and don’t want to muddy the flavours with heavy hands. Put 1 tbsp of the ghee in a pan and heat. Add the lentils, ginger, turmeric and about 3 cups of water. Let the mixture come to the boil and let then reduce the heat to a simmer and cover: do not add salt until the end as this toughens the lentils and they take longer to cook! The lentils should take about 30-40 minutes to cook: mix periodically to avoid burning the bottom and add water/increase heat as required to get the desired consistency and avoid the lentils drying out. Make sure you put the rice on too. When the lentils are nearly cooked, prepare the tadka. In a small pan add the remaining ghee and heat on a medium-high heat with the cumin, letting it crackle and splutter. Now add the garlic and allow to cook and brown ever so slightly (keep on stirring to avoid burning! 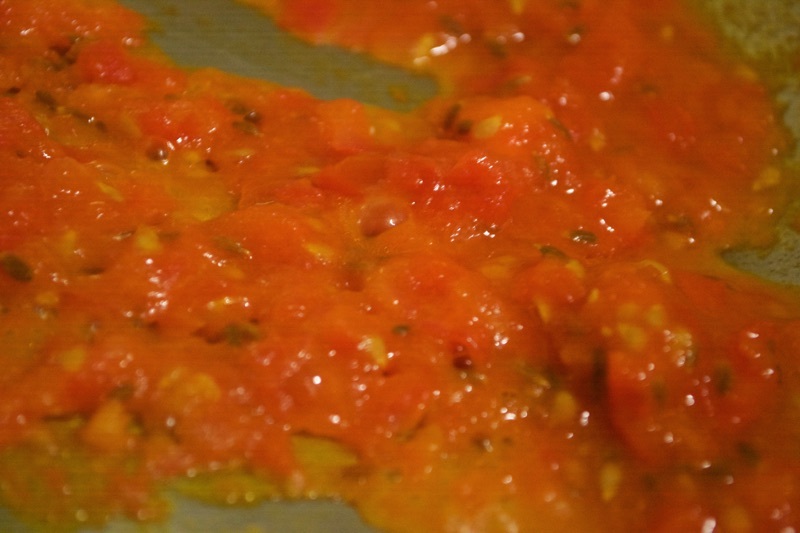 ), followed by the tomatoes and puree. Stir this and let it reduce down to a jammy consistency. The dhal will be ready when mixture is nice and thick and creamy, the red lentils having broken down, and the channa dal should be soft, not hard at all. You can now add the tadka and add salt to taste. Serve with the rice, salad, your favourite chutney and maybe some yoghurt.